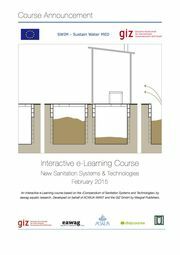 This e-Learning course is based on the «Compendium of Sanitation Systems and Technologies» by eawag aquatic research. This compendium was developed in the context of the Community-Led Urban Environmental Sanitation Planning (CLUES) – a multi-sector and multi-actor – approach accounting for water supply, sanitation, solid waste management and storm drainage. The course has been developed as a part of the ACWUA-WANT Capacity Building initiative, promoted and subsidized by the GIZ GmbH, Germany. This course is intended to be used by engineers, planners and other professionals who are familiar with sanitation technologies and processes. It is not a training manual or stand-alone resource for people with no experience in sanitation planning. ✓ Describe and fairly present the technology-specific advantages and disadvantages. The e-learning course is divided into 2 units. «System Templates» consist of 8 parts describing the structure and the components of complete sanitation systems. Every system template gives short overviews on the function, the use and the pros/cons of the components which are needed to establish this sanitation system. «Functional Groups & Technologies» describes around 50 technological components of which a particular sanitation system may be composed. The technological components are organized in 5 groups. The course announcement [see PDF in the box on the right] gives a full list of all lessons. The e-Learning course is designed for a total learning time of 4 weeks. As mentioned above, the course is meant for professionals from the sanitation sector. That's why the course is supposed to be used on an extra-occupational basis. Beside their daily work, participants should calculate with 1 hour per day to browse through the reading material and to develop their own sanitation scenario. Beside the interactive presentation of the learning content, the course includes Webinars, Multiple Choice Tests and Exchange Forums for a collaborative group work. PRE-Course: You need to complete the PRE-Course «Sanitation21» and the online test successfully TOGETHER with you application. Professional Background: Participants are engineers, planners or other professionals and are familiar with sanitation technologies and processes. Workload: At least 6 hours per week in order to complete the course successfully. Technical environment: Up-to-date browser and a stable internet connection to read the course and work together with other participants on the individual system templates. Also required: a headset to join the interactive web-sessions. Language: The B2 language level is required to follow the course. Course period: February 02 – March 02, 2015 (only for those who absolved the PRE-Course «Sanitation21» and the short online test successfully) -> Study the course announcement carefully. Application: 16 – 25 January, 2015. Application is possible online only.